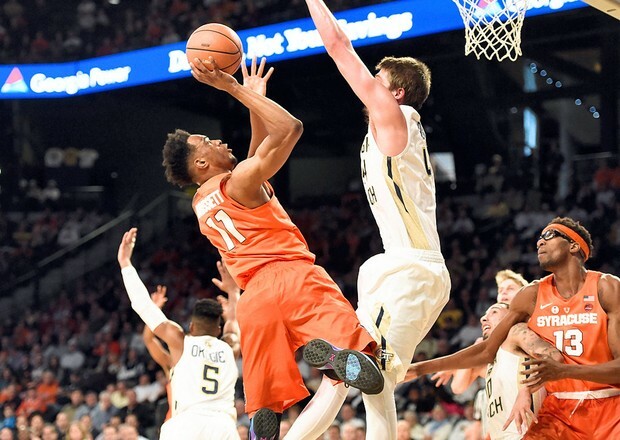 Atlanta — Georgia Tech defeated the Syracuse basketball team 55-51 on Wednesday at McCamish Pavilion. The Orange dropped to 15-7 (4-5 ACC) with the loss. Check out the best and worst from SU's performance against the Yellow Jackets (11-11, 4-5). Syracuse managed to make 30 percent of its field-goal attempts against Georgia Tech. That’s the worst shooting day/night of the season for the Orange. Frank Howard and Tyus Battle combined to shoot 8-of-34 overall and 4-of-15 from the 3-point line. Frank Howard was 4-for-17 overall, 2-of-9 from three. He had five turnovers and committed a late-game technical foul. Marek Dolezaj filled the right lane on the Syracuse fast break, caught a pass from Frank Howard, threw down a ferocious dunk and then sort of stopped and stared in its aftermath. Georgia Tech caught Syracuse defenders napping with about 16:10 left in the game. Jose Alvarado threw a lob pass to the rim, 6-foot-4 Josh Okogie dunked it. And Syracuse coach Jim Boeheim called for time, his team down 32-25. Syracuse committed 15 turnovers and Georgia Tech outscored the Orange 14-4 off turnovers en route to a 55-51 win. The teams combined to shoot 18-of-53. That’s 34 percent. Syracuse had more turnovers (8) than field goals (7). Georgia Tech handed out these T-shirts to students for a “white out” promotion. They apparently referenced John Gillon, who shot an air ball last season here and was taunted about it the whole game. Good idea if Gillon were still on this SU team. But he’s not. Syracuse will face No. 2 Virginia (21-1, 10-0) at 4 p.m. Saturday at the Carrier Dome. The Cavaliers defeated Louisville 74-64 on Wednesday. Virginia defeated Syracuse 68-61 on Jan. 9 in Charlottesville. 0 Response to "Best and worst from Syracuse basketball at Georgia Tech"